Ratatouille, like most of Pixar’s feature films — let’s all just pretend Cars 2 never happened, shall we? — has supporters who think it’s a masterpiece. As undeniably brilliant as Brad Bird’s direction and visual style are in Ratatouille, though, the story has always left me vaguely pissed off. 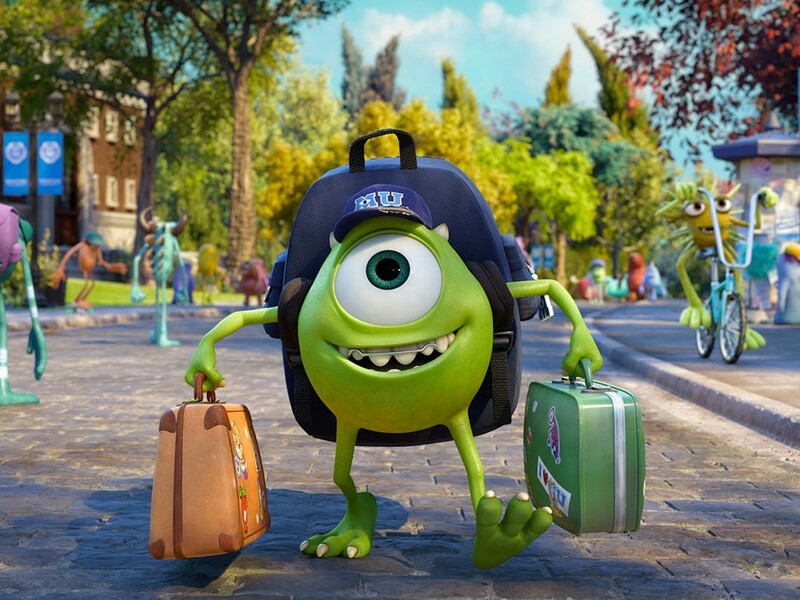 And now, thanks to Monsters University, there’s a chance to show — through its opposite — exactly why. It’s easy to approach sequels and prequels with arms folded, looking at them as mere cash grabs, (cough Cars 2) and perhaps it seems there’s nothing inherent to the story Monsters University tells that couldn’t have been told just as effectively with different protagonists than Mike Wazowski (Billy Crystal) and James P. “Sully” Sullivan (John Goodman). But as long as Pixar was going to revisit these characters, and choose their college days to do it, they couldn’t have chosen a more fitting premise: a story about what it means to discover who you are, and what it’s going to take to become who you want to be. Director Dan Scanlon and his writing team actually start even further back than college, with Mike as a schoolboy outcast on a field trip to the Monsters, Inc. scare floor. There he falls in love with the idea of becoming a professional scarer, that dream carrying him to the study of scaring at Monsters University. And while nobody hits the books harder than Mike — certainly not classmate Sully, who seems convinced that his family history of scaring excellence and his innate ability will be enough — he winds up failing a key exam, forced along with Sully out of the program. The opportunity to get back into the scaring department emerges through a university-wide “Scare Games,” and here Monsters University takes advantage of a familiar college-movie trope: an outcasts-vs.-elites competition straight out of Revenge of the Nerds. Mike and Sully hitch their wagon to a fraternity of losers — middle-aged salesman Don (Joel Murray), two-headed Terri/Terry (Sean Hayes and Dave Foley) and company — for a structure that allows for plenty of lively set pieces, including an attempt to sneak quietly past a monstrous librarian and avoiding poisonous critters representing the still-thought-to-be-toxic human children. While Scanlon and the animators play around with more basic college-set gags — a footless monster finds himself sadly out of place in a game of hacky sack — and introduce other familiar characters like Randall Boggs (Steve Buscemi), the plot stays firmly anchored in the story arc rather than easy references. That’s part of what makes Pixar Pixar. But what makes Monsters University particularly satisfying is recognizing something more complex about aspiration than the ideas Ratatouille purveyed. That film was all about the primacy of pure talent — recognizing it, nurturing it, knowing when to admit when you haven’t got it. MU takes Mike’s journey in a different direction; he’s like a spherical, one-eyed Rudy, a little guy on a mission, steadfastly refusing to believe everyone telling him he doesn’t have what it takes to do the one thing he wants to do more than anything. Sully gets his own side of this story, facing the pressure of family expectations while lacking Mike’s ferocious work ethic, and the two initial antagonists become teammates for the best of reasons: recognizing in one another something that can get them both to their goals. So while this may not be as transcendent an experience as Pixar at its best — the jokes aren’t always spot-on, and the new supporting characters don’t really leave an impression — it’s a perfect narrative for a creative institution that could cruise on its pure talent without putting in the effort, yet almost never does. Here we see Mike and Sully working their way to the place where we find them at the beginning of Monsters, Inc. And maybe it’s even perfectly tied in to Monsters, Inc.’s opening scenes, which find Mike as the coach pushing Sully to be his best. Monsters University takes those characters to the point in life when most of us are realizing that some things are going to be harder to achieve than we expected — and when we learn whether we have not necessarily the talent, but the character, to fight for it anyway.